In a live Telegraph webchat today with Nicky Morgan (hosted by online Education Editor Josie Gurney-Read), the Education Secretary’s answer to Summer Born Campaign member Samantha McCormick highlighted the subjectivity and inconsistency that the DfE’s policy allows – but also her comments on other policy areas exposed the perfectly obvious flaw in children being forced to miss a year of school. Q: My daughter is born in August. I wish for her to start school at Compulsory school age in reception and access a full education. Why is there not a more simple, fairer system in place to allow this? My LA require “evidence” when other LAs around us don’t! A: We’ve published guidance to make clear to local authorities and schools that there is no barrier to admitting pupils outside of their normal age group, that they won’t lose out on funding and there is no impact on assessment. We did specifically to address concerns around summer-born children. It’s also worth asking the school you have in mind what their position is. And when that school’s (or council’) position is ‘no‘ (as is so often the case) what happens to our school preferences then? No barrier is not the same as an automatic right, as the DfE knows only too well. 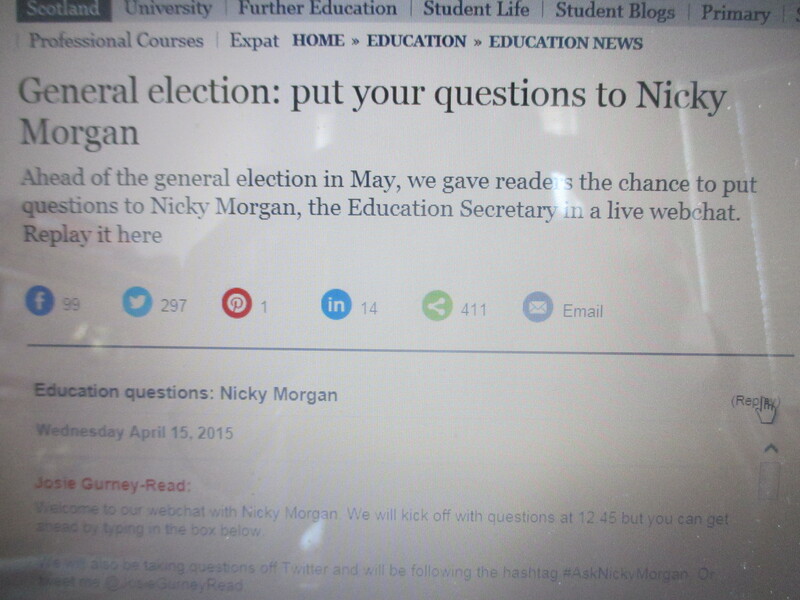 And why didn’t Nicky Morgan address the issue of inconsistency in her answer? Ministers make positive noises but the reality is scandalous – voters beware. A: Every day a child takes out of the classroom is a day that they’ll have to catch up at some other point, making their life difficult and increasing the pressure on teachers who have to help them catch up. Our research shows that pupil absence has a very real impact on their performance at GCSE level and good attendance starts early. That’s why many schools have introduced their own measures to tackle poor attendance. There does however remain discretion for head teachers to authorise pupil absence in exceptional circumstances and the NAHT has produced guidance to help schools interpret this. The Summer Born Campaign is aware of children being forced to miss a whole year of their education (not just Reception class but later on in school too) against their parents’ wishes and DfE Ministers and officials refused to intervene. Why can the government not see how illogical its summer born policy is? A: [I] think it’s right that we set high ambitions for what we want our children to achieve. For too long we’ve been accepting of low standards and mediocre results internationally, but if we’re going to compete in the world then the next generation need to have the skills to do that. We’ve already made significant improvements to literacy and numeracy over the course of this Parliament, thanks to the introduction of our phonics check and a rigorous new primary curriculum, but I know that over the next five years we can go a lot further – which is why so much of our manifesto commitments in education are about making sure every young person masters those basics of English and maths. Your predecessor heaped praise on Alberta’s standard of education, which has a flexible admissions entry for youngest in year in which parents choose whether to enrol their child one year early or AT CSAge. How does the government expect summer born children to master the basics if they’ve been forced to miss their ‘critical’ and ‘crucial’ ‘foundation’ year (‘all the DfE’s own words’) that is Reception class? Or indeed if they’re forced to miss Year 1, Year 2 or even Year 6 or Year 7 (all of which have been threatened or actually happened to summer born children)? This entry was posted in EXAMPLE CASES, MEDIA COVERAGE, MEMBERS OF PARLIAMENT, THE DEPARTMENT FOR EDUCATION. Bookmark the permalink. It was very reassuring…. we’ve produced documentation outlining options to councils; But I’d check with your school! So either councils are aware of their duties and have to fulfil them, or they don’t! I think parents have a right to decide if their summer born children can start Reception Year at Compulsory School Age. It’s a matter of weeks that impacts the rest of their school experience! It should be a consistent & available choice across the board for all choice. Gosh how patronising, does she not think you have already done this? Why not just amend the code and give parents the right to choose.